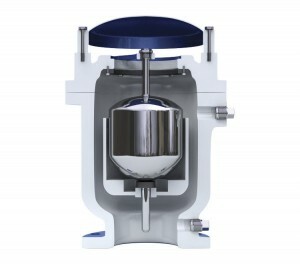 Air/Vacuum Valves are float operated, having a large discharge orifice, equal in size to the valves inlet. Air/Vacuum valves allow large volumes of air to be exhausted from or admitted into a water pipeline as it is being filled or drained. As the pipeline fills, water enters the Air Valve, raises the float and shuts-off. When draining the pipeline, the float drops, allowing air to enter, preventing vacuum, possible pipeline collapse or damaging water column separation. Air & Vacuum Valves are an efficient means to fill and drain pipelines.